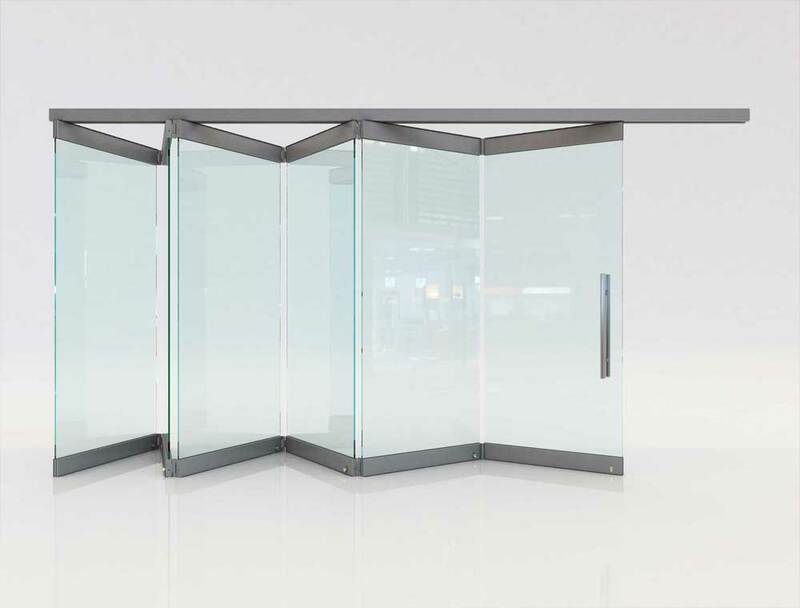 Characteristics: Tempered glass (10mm), held together using hinges, no bottom rail driver, no aluminum frames, glass-board clamping using horizontal upper and lower aluminum profiles, stainless steel rollers, polycarbonate insulation profiles along its panel's full length. Top, bottom and side insulation with brush seals. Basic dimensions: 105mm for upper and lower aluminum profiles, aluminum track size: light type 60x53mm or heavy type 75x72mm. In the F1 sliding door system, the panels are hinged together and folded in position using (stainless steel) rollers in a roof-mounted driver, ensuring smooth, unhindered and silent movement. It comes with 10mm tempered glazing, which does not bear holes or notches, since glass suspension is achieved with Salinox’s patented design (patent No. 1004694). Each pane is secured and locked with a lock mechanism included in lower aluminum clamps; either cylinder locks or floor bolts, which can be adjusted considering the floor’s morphology and other particularities of each individual project. Water and air tightness is achieved with transparent polycarbonate or aluminum profiles fitted in between adjacent panes, while the end panes on the opening’s sides bear synthetic brushes. Its aluminum profiles come equipped with similar brushes, covering gaps between the top rail and upper profile, as well as between the floor and lower profile in the most efficient possible manner. The available options of the aluminum guide are either standard type with a cross-section of 60x53mm or heavy type with a cross-section of 75x72mm, and based on the requirements of the project we choose the appropriate type. If the size of the panels does not exceed 90cm in width and 240cm in height (with a maximum weight of 70kg) then the standard guide can be used, otherwise, the heavy-duty driver is used, allowing usage of panels of up to 100cm wide and up to 300cm tall (with a maximum weight of 80kg). The F1 system can include two and up to ten panels span per opening, with an optional opening door, allowing for many design options. The F1 folding doors system is an excellent choice for relatively small spans where a parking trail option is not desirable, such as store windows, external shop areas (for example in cafeterias) or patio entrances. In addition, its elegant design makes it ideal for indoor usage, especially in cases where spaces may need to be isolated and used separately in a safe and easy way, such as office dividers. No need for parking area: Under certain circumstances – especially indoor spaces – the use of a parking trail is not aesthetically desirable. Design flexibility: Several system design options, including panel hanging position: either centered on the aluminum guide, or on one side of the guide or on a specified distance. Panels can be gathered to either side, or half to the left and half to the right, with or without an opening door. Minimal aesthetics: Elegant, contemporary design. Glass is held together with upper and lower aluminum clamps, thus maximizing the glass surface by avoiding the use of aluminum frames. Easy operation: "Accordion" type: by pulling out the first pane, the rest follow. Smooth and easy sliding thanks to the top track rail and hinges.